While all the other writers chose to review the Edmund Clark exhibition at Ikon Gallery, Rachel Magdeburg decided to focus her 600-word piece on an exhibition of works by the 19th century convict artist Thomas Bock. This is her review. Thomas Bock was living not far from where Ikon gallery now stands when he was found guilty of the crime that would see him transported to a British penal settlement. He had tried to force his impregnated mistress into miscarrying by consuming poison; mother and child survived and in 1823 Bock was sentenced to 14 years transportation. Bock (c.1793-1855) had previously demonstrated artistic competency, so upon arrival in Hobart, Van Diemen’s Land (Tasmania) his servitude was first in commercial design and then portrait commissions for free settlers. The rationale for this exhibition at a contemporary art gallery emerges within the context of Ikon’s complementary show, ‘In Place of Hate’, by artist Edmund Clark. Both exhibitions focus on the role of the artist within a juridical system. Clark is artist-in-residence at HMP Grendon, Buckinghamshire; Bock convicted felon. The museum-style Bock exhibition is brimming with modestly sized, identically framed, drawings and watercolours. A handful of Degas-esque nudes of Bock’s second wife openly permit the viewer to indulge in her solid form and his dexterous dabs of white pencil-highlights elicit lifelike hips and bottoms. These skilful observations are conventional in subject matter, but beguile in their virtuosity and mimicry of glowing skin. Also included are colour-tinted daguerreotypes, a logical progression for Bock in his quest for verisimilitude. The gallery includes sketchbooks enshrined in vitrines. Open pages reveal, initially, un-remarkable pencil sketches of a man’s head, tilted backwards, presumed asleep. The title, ‘Alexander Pearce Executed for Murder July 19th 1824’, signals their drama. These are post-mortem recordings of a hanged man. Pearce was a thief, transported to a notorious penal station, escaping twice and surviving both times on human flesh. They were commissioned by a colonial surgeon to reveal the corpse’s psychology. However, Bock’s journalistic stilled-life observations record the cannibal unsensationally. Another restrained but emotionally charged memento mori is of Edwin, Bock’s deceased son. Inside another case, beneath a light-shielding cloak, is a full-length vulnerable watercolour of a child, wearing a vivid Western-style red dress, posed obediently, school-photograph style. Ikon’s gallery assistant nicknamed this exquisitely painted face, the ‘Mona Lisa of Tasmania’. 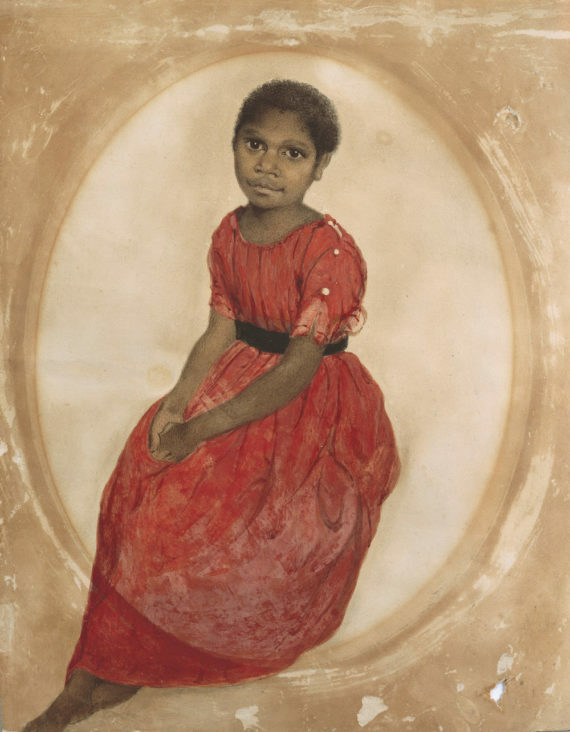 The enigmatic expression belongs to seven-year-old Aborigine Mithina, ‘adopted’ in 1842 by wealthy colonialists who commissioned Bock’s painting. Mithina’s governors left the colony, abandoning her to a wretched fate. This tragic interference epitomises how British settlers imposed themselves and their customs upon native populations. On the gallery’s surrounding walls is Bock’s terrific portrait series of Aborigines, commissioned by George Augustus Robinson in 1831-35, who instrumented their exile and ‘resettlement’, betraying the indigenous people ultimately to prison-style conditions and persecution. In one painting, the deeply furrowed brow of Manalakina (Mannalargenna) looks directly at the artist, therefore us. His multiple neck jewellery, deftly braided hair coated in red ochre and smoking bush-fire stick is ethnographically revealing. Other realistically modelled Aborigines wear kangaroo furs and clasp spears. However, these were never intended as works of art, and you wonder what the sitters would think about being gawped at in a post-colonial UK contemporary gallery. 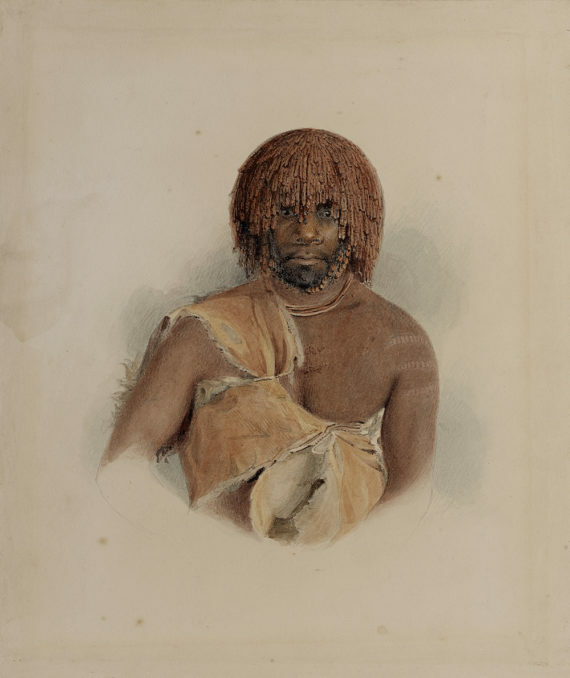 Thomas Bock didn’t portray Aborigines as exotic, or unlawful, but empathetically as proud and healthy individuals with names, characteristics and accessories. Bock was a criminal, forced to relocate, so how could he pass judgement? By showing this exhibition in the UK at a time of great anxiety over migration, prison capacities and uncertainties over identity and borders, this exhibition of drawings made almost 200-years ago in a colonised land, has a contemporary resonance to match its historical significance.